Digital Rights Foundation marked the launch of their Network of Female Journalists on Online Safety on 12th December. The launch was coupled with a two-day advance training with 28 female journalists from across Pakistan. The objective of the network is to empower female journalists to practice and promote online safety within media houses and to raise awareness regarding digital rights issues in mainstream media. Journalists were made aware about reporting on digital rights issues leading to improved quality of reporting when talking about the said rights. The network will ensure quick and easy access to DRF’s Cyber Harassment Helpline to journalists and human rights defenders. 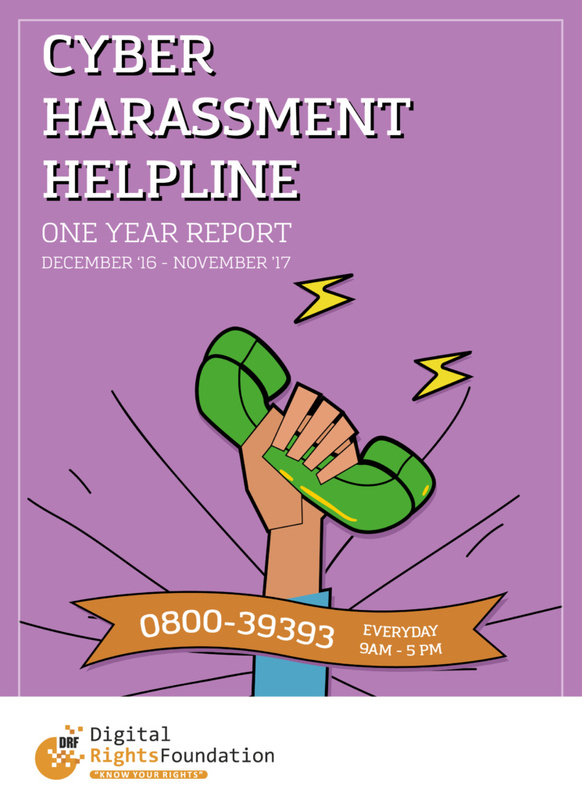 The helpline is the first of its kind in Pakistan and provides legal advice, digital security support, and psychological counseling to the victims of cyber harassment. Digital Rights Foundation is at the Twelfth Annual Internet Governance Forum (IGF) happening in Geneva, Switzerland from 18th to 21st of December, 2017. The dynamic get-together of diverse stakeholders will discuss pressing public policy issues related to the digital world. It allows all participants to share their experiences and debate, as equals, the opportunities and challenges arising from the process of digitization. Read the details of the interventions by DRF here. 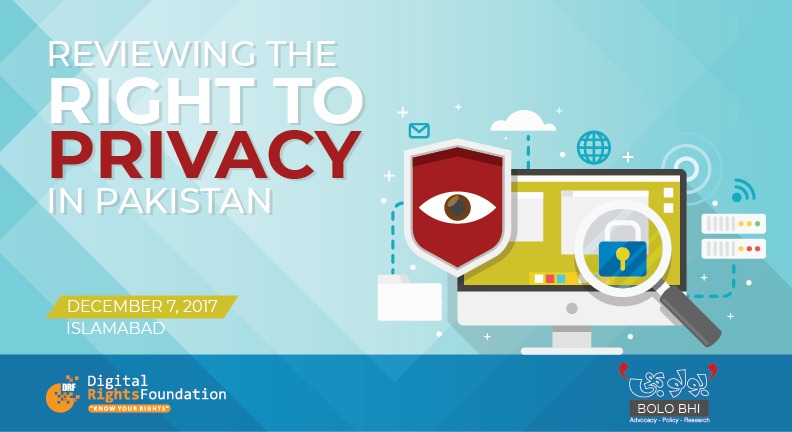 Digital Rights Foundation (DRF) and Bolo Bhi organized the “Reviewing the Right to Privacy in Pakistan Roundtable” at the Islamabad Hotel, Islamabad on Thursday, December 7th, 2017. The goal of the roundtable was to have a comprehensive and interactive discussion with relevant stakeholders about data protection and the right to privacy in Pakistan. International and national trends and developments in regards to digital rights, freedom of expression online, and data protection measures were discussed at the event. The conference covered the themes of data protection and privacy on the internet within the Pakistani context through participatory sessions with participants. The first panel, titled “Data Protection and the Open Government Partnership Process”, was moderated by Nighat Dad, and shed light on the commitments made by the Ministry of Information Technology (MoIT), under the Open Government Partnership (OGP) process, to introduce a data protection law in Pakistan. The panelists included Ali Mohyuddin and Ebrar Rashid from NADRA, Arzak Khan, Saad Saleem, the co-founder of Nayatel, Imran Haider from FIA, Natalia Tariq from Open Society Foundations, Saleha Zahid from Bolo Bhi, and Jannat Ali Kalyar from DRF. The second panel, titled “The Right to Privacy through Gendered Lens”, addressed the gendered nature of the right to privacy, with particular focus on the gendered experiences of this right. The panel, moderated by Zoya Rehman, brought together a diverse set of perspectives to discuss the variations as well as overlap of the gendered nature of the privacy discourse within Pakistan. The panelists, which included Khawar Mumtaz, chairperson of NCSW, Shmyla Khan of DRF, Mehlab Jameel, Fatima Anwar from Engage Foundation, and Dr. Safieh Shah, further discussed how privacy from a gender perspective is a vital part of the larger discourse on internet rights. Digital Rights Foundation has been working on women's safe access to technology since it was founded in 2012, and we always try to keep our narrative unbiased and our conversations inclusive. Some of our team members were actively involved in the drafting of the Feminist Principles of the Internet also, and implement their learning and knowledge along with these principles in our projects in Pakistan that primarily involve advocating for a feminist internet, while promoting digital security and countering online gender based violence. With this year's 16 Days of Activism on Violence Against Women, we decided to mainstream the feminist internet discourse in Pakistan - a topic that has not been highlighted all that much here - through the hashtag #HamaraInternetKyaHai (Urdu for What is Our Internet?). Our communications team strategised and executed the campaign keeping multiple approaches in mind, making sure people understand the narrative and engage in the conversation. And we're truly glad that they did take part in the conversation through various mediums, be it by comments and tweets on social media, or via expressing their interest directly to the DRF team members, or through the Cyber Harassment Helpline that we launched in 2016 and is accessible to people via toll-free number. This video proved to be important in two ways in the context of Pakistan; a) a lot of people who reached out to us with a feedback on the campaign accepted that this video has helped them accept that it's not a woman's fault if someone bypasses technological loopholes and records them in their private space, where they're supposed to be feeling safe, and b) they understood that digital security is really important to be practiced. A lot of them also said that they covered their webcams after watching this video. 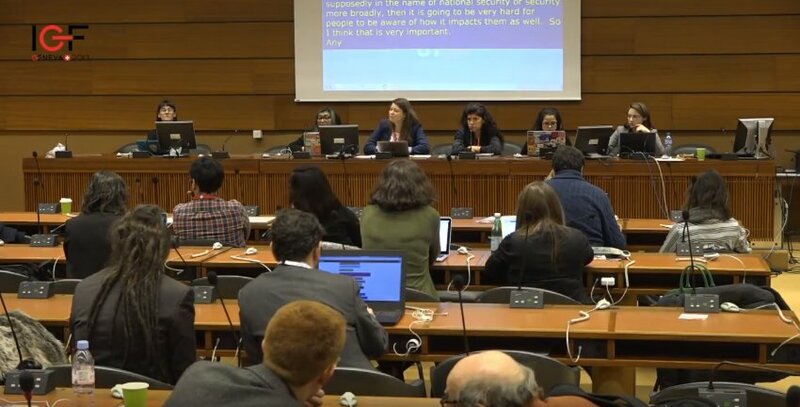 On December 20th, 2017, Digital Rights Foundation submitted its response to the Special Rapporteur on the promotion and protection of the right to freedom of opinion and expression, for the upcoming study, “Content Regulation in the Digital Age” as part of the June 2018 Human Rights Council Report. Trust for democratic education and Accountability held an orientation consultation on Promoting the Human Rights And Electoral Participation of People with Disabilities (PWD), Transgender people and women in Pakistan on 12th till 14th of December 2017. The meeting brought together human rights defenders from all over the country to discuss inclusiveness in elections and the role of the civil society organizations. DRF and TDEA signed an MOU to increase inclusiveness and capacities of people with disabilities (pwd), transgender people and women in the upcoming elections. DRF became one of the founding members of Coalition for Inclusive Pakistan (CIP). DRF and TDEA conducted a small consultation meeting on 20th of December 2017 with women from diverse backgrounds to discuss about the importance of voting and the legal rights women have in Pakistan. Through the consultation women identified the problems they face while contesting for elections and voting and what needs to be done by the election commission and political parties to make the political environment better. Representatives from DRF delivered an interactive session at the Punjab Revenue Authority (PRA) with their young interns on digital rights, online harassment and using the internet as a tool to hold government officials accountable. DRF also conducted interactive exercises to help students harass the internet for awareness-raising and dissemination of information. Digital Rights Foundation submitted its response to the UN Special Rapporteur on Violence Against Women. 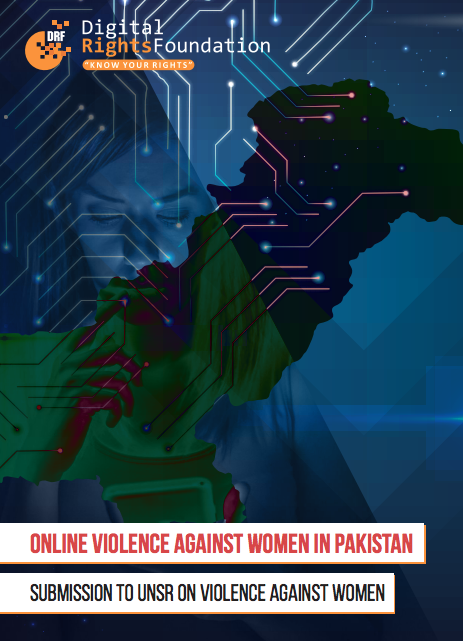 This report explores the laws and institutions that are in place within Pakistan to deal with issues of online violence against women. Facts and figures are used to gauge the extent of the problem and its nature, relying on data provided by the government, law enforcement agencies and collected by DRF. A legal analysis of the legislation ise accompanied by an appraisal of the implementation of the laws and the functioning of institutions on the ground. Reported judgments are analysed to gauge jurisprudence (interpretations of the laws) as well as legal principles developed by local courts. The purpose of the report is not only to analyse the existing structures, but to situate them within the lived experiences of women facing online violence. This experience is elucidated through case studies as well as analysis done by DRF’s cyber harassment helpline team. We hope that this submission will provide a sufficient overview of the regulatory and social landscape in Pakistan with relation to online violence against women. The report can be accessed here.